1. Preheat the oven to 200°C, gas mark 6. Place the chicken on a baking sheet and roast for 30-35 minutes until cooked through. 2. Meanwhile, cook the barley and rice mix and the asparagus and green vegetables in the microwave according to pack instructions. 3. 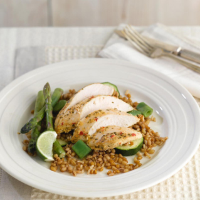 Divide the rice mix between 2 plates and serve with the chicken, vegetables and lime wedges.